Shortly after I was ordained, I was asked to give a tour of our parish church to an interdenominational group. A woman stopped me and asked, “Don’t Catholics believe in the resurrection of Jesus?” I assured that we not only believed, but that that doctrine is central to our understanding of salvation. I admit that I was surprised by the woman’s assumption, but since then I have become grateful for her questioning. Having grown up Catholic and having looked at a lifetime of crucifixes, I had never found any contradiction in seeing Jesus on the cross and believing that Jesus rose from the dead. And I still don’t see a contradiction between the two. In fact, the unity between the two images has only grown stronger as I realize we have to believe in the selfless dying in order to give glory to the rising. Put another way, Easter cannot happen without Good Friday. Nonetheless, it is easy for people to lose a balance between these two aspects of our faith. Many of the contemporary Christian songs, I’ve discovered, emphasize the cross and Jesus’ redemptive dying on the cross. This, of course, is not new. Even great old hymns like “The Old Rugged Cross” did the same. We don’t want to stop at the dying, however. If Jesus’ dying is the ultimate act of sacrifice, the wondrous love that transforms all love, then the rising is the hope for all those who die with the Lord. At the same time, there is a temptation to glory in the resurrection without admitting the dying. We truly are an Easter church but only when we know that our dying with the Lord has to continue again and again. It was not uncommon, in the euphoria of the early days after the Second Vatican Council, for people to recite something like, “We are an Easter people, and Alleluia is the song we sing.” There was joy and hope, but also more than a bit of naivete. Being people of Easter means more than merely feeling good. We are firmly anchored in the paschal mystery itself that calls us to new life through death. A conviction that we are Easter people becomes apparent in a healthy parish. It’s not done through hyperactivity and a near manic approach to liturgy. Instead, there is a pervasive sense of purpose and a strong commitment to discipleship of the Lord. As Jesus died and rose, so must his followers. At our parish, we have discovered that the best representation of Jesus as the risen Lord is found in the way we live as church. In other words, we have to live as people who truly believe not only in the resurrection of Jesus, but that the resurrection of Jesus has made a difference in our own lives. This conviction becomes apparent in the way we gather for worship, and then follows in various forms of outreach and service. Just as individuals must personally embody the paschal event of rising after dying, the same is true for parishes. 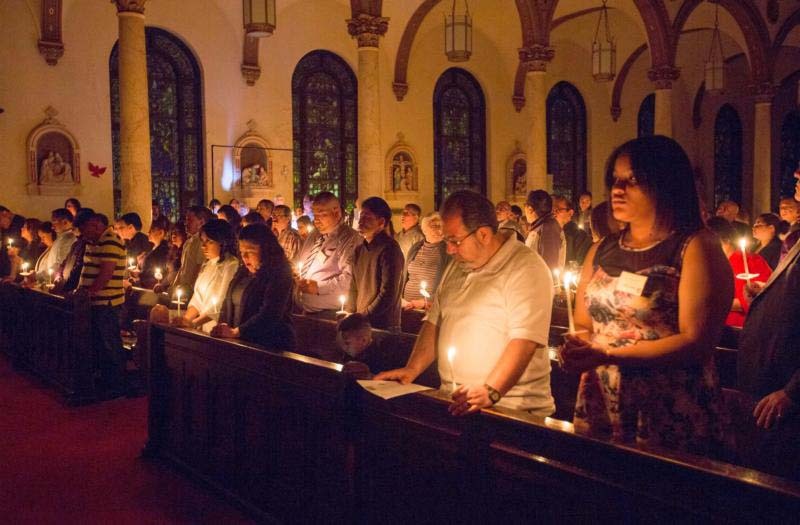 By having a powerful sense that the risen Lord is present and that each person is to be treated with dignity and respect, the church community begins to live Easter. With acceptance and gentleness for all, hope and healing is provided for people. It’s not just one thing that people do, but the amalgam of all that the parish is. In short, the parish has to be hope-filled and enthusiastic about its mission to reach out to others. Yes, we glory in Easter, especially when it is seen in its fullness as it follows Good Friday. Father Weber is the founding pastor of St. John XXIII Parish in Perrysburg, Ohio.